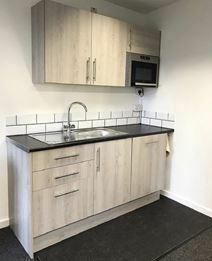 Located just five minutes from the railway station, this centre is well equipped with an on-site management team, a lounge and cafe area, meeting room availability, parking spaces, changing rooms and showers, and postal facilities and mail handling all offered. Cobham has many places to eat and drink, as well as a supermarket and other facilities including banks. The space offers a free shuttle service, connecting your office with transport links. Situated in the charming, leafy village of Cobham, this centre provides an excellent space for businesses to flourish, giving tenants the opportunity to customise the space to their design and also providing a wide range of amenities. Tenants will benefit from 24hr access, fast WiFi, cleaning services, kitchen facilities and breakout space. The centre is also just over a mile from Cobham station, which provides direct access to London Waterloo. Occupying the first floor of the Extra Motorway Services Area midway between Heathrow and Gatwick airports this Cobham business centre includes a Wi-Fi enabled business lounge and private meeting rooms ideal for the mobile workers.